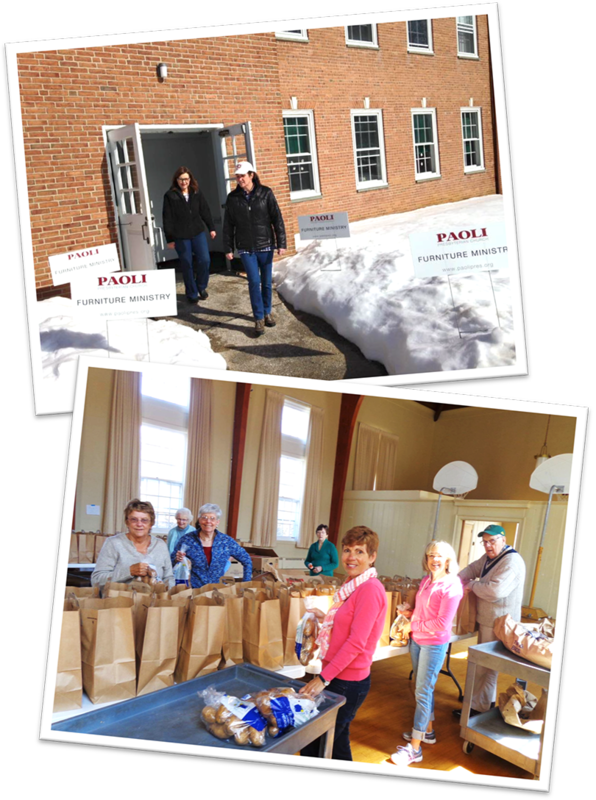 Asking for the Lord’s help, Paoli Presbyterian Church seeks to serve and be in relationship with struggling families in our area by providing a community food pantry and operating a furniture-distribution center. We help with outreach to the homeless and the addicted in Chester, PA, and partner with a Christian school in Philadelphia. These are among the local mission projects we support with our dollars, our volunteer labor and our prayers, all in the name of Jesus. The PPC FOOD CLOSET is a member-provider of the Chester County Food Bank. In addition to monthly food distribution for seniors and families, we provide special food baskets to help families celebrate Christmas, Thanksgiving and Easter. The PPC COMMUNITY GARDEN PROJECT provides fresh seasonal produce for the Food Closet and other community needs. The PPC FURNITURE MINISTRY operates from the lower level of the church. Volunteers go out on Wednesday evenings to pick up gently-used furniture donated by people in the community. We then distribute the furniture on Saturday mornings to families that register by calling the church. Good-quality single beds and dressers are most needed. The PPC WINTER WONDERS program is an event in which we join with families from the Tredyffrin/Easttown and Great Valley school districts to celebrate the joy of Christmas. The program offers assistance with family Christmas presents, and includes a festive meal and entertainment. “20,000 MEALS” is part of our annual Big Day at the church in May. We work with the Stop Hunger Now organization to assemble and package non-perishable meals for shipment around the world. CITYTEAM provides family assistance, temporary shelter, and drug-and-alcohol programs in Chester, PA, one of America’s most disadvantaged cities. PPC volunteers prepare and serve meals at the Hope Cafe, and lead a worship service. Members help with the mother-and-baby program by providing supplemental baby supplies. The church also has provided backpacks with school supplies for the Chester community. HOME OF THE SPARROW, Exton, provides safe transitional housing and other services for women and their children. REDEMPTION CHURCH is a network of house churches planted in Bristol, PA, in 2009. Redemption encourages community living, revitalization and entrepreneurship in Bristol. Led by the Rev. Gary Alloway, who grew up at PPC, Redemption also meets the needs of people on the margins in its community. THE VILLAGE, Rosemont and Southwest Philadelphia, provides child welfare, residential programs, mental health and prevention services to children and families. YOUNG LIFE of Chester County connects high-schoolers and middle-schoolers with caring adults who mentor them in growing up and growing in faith. The affiliated YoungLives in the Delaware Valley, based in Berwyn, connects pregnant teens with Christian women through clubs that support them during their pregnancies and as new mothers. GOOD WORKS, Coatesville, is a Christian organization dedicated to repairing homes for people in need.